A personal banana cream pie is the perfect way to tell Dad how much you love him. All the delicious sweetness of a full size pie that he doesn’t have to share. It’s a tradition in our house that my husband gets a banana cream pie at least twice a year, for his birthday in March and Father’s Day in June. For years I made it. When they got old enough, our girls took over, at least on Father’s Day. Now they both live away from home and it’s back to me again. Making banana cream pie is something I do willingly because the joy on his face is worth the time and effort. This year, with only two of us at home, and one who doesn’t really eat sweet things much (me), I decided it made more sense to make a personal banana cream pie. Cut in half, it’s two very generous pieces and you can guess who enjoyed both of them! When a whole 10-inch pie is just too much pie, downsize! Are you cooking for an empty nest too? You might find my tips on cooking for an empty nest helpful. 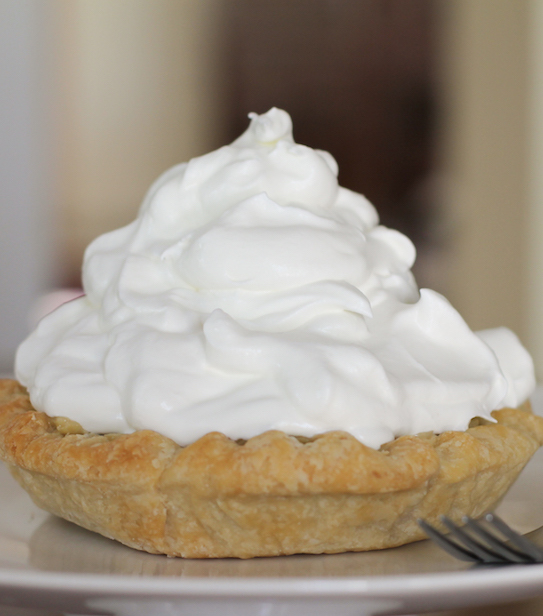 Conversely, if you want to make a full size banana cream pie, <click there. In a large saucepan (no heat!) mix sugar, flour and salt. Stir in milk until smooth. Separate your egg yolks from your whites, putting the whites directly into a sealable plastic container for the refrigerator. (You can make meringues or almond macaroons with these later.) Put the yolks in a bowl with enough room to whisk. Beat egg yolks quickly with a whisk, while drizzling in about a 1/8 cup of the hot milk mixture. Quick beating and slow drizzling are essential so that you don’t end up with cooked eggs. Slowly pour egg mixture into the saucepan, stirring rapidly to prevent lumping. I stopped whisking briefly to take the photo. You just keep whisking! Remove from heat; stir in butter and vanilla. Congratulations, you have made homemade vanilla custard. Once the butter has melted and you've mixed it and the vanilla completely in, pour the custard into a metal bowl. Cover its surface with plastic wrap to prevent a skin from forming. Refrigerate until chilled and set, about two hours. While the custard is chilling, we'll make the pie crust. Preheat your oven to 425°F or 218°C. 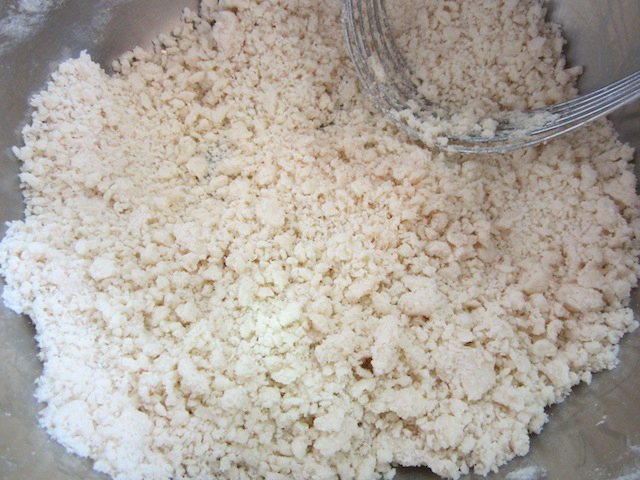 In medium bowl using a fork, lightly stir together the flour and salt. 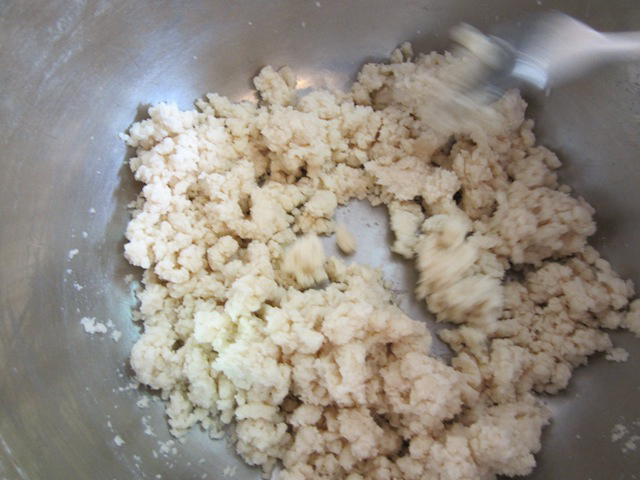 With a pastry blender, cut in the shortening until the mixture resembles coarse crumbs. 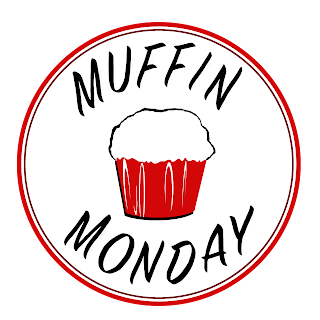 Sprinkle in the cold water, a tablespoon at a time, mixing lightly with a fork after each addition until pastry just holds together. Use your hands to shape the pastry into a ball. Wrap it in cling film and refrigerate 30 minutes. Lightly flour your clean work surface. With lightly floured rolling pin, roll pastry into circle 1⁄8 inch thick and about 2 inches larger all around than pie plate. 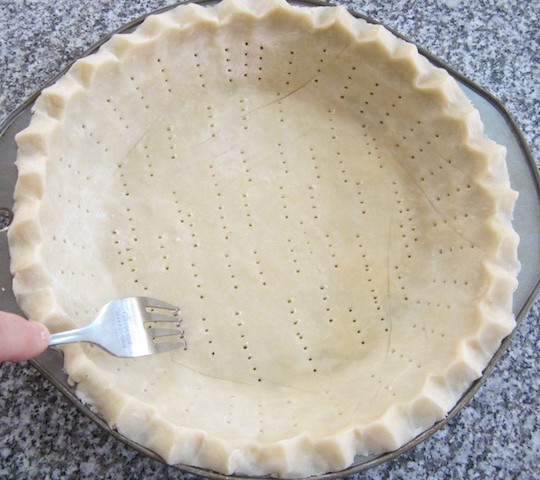 Transfer the circle to your pie plate. Fold overhang under; then pinch to make a decorative edge. 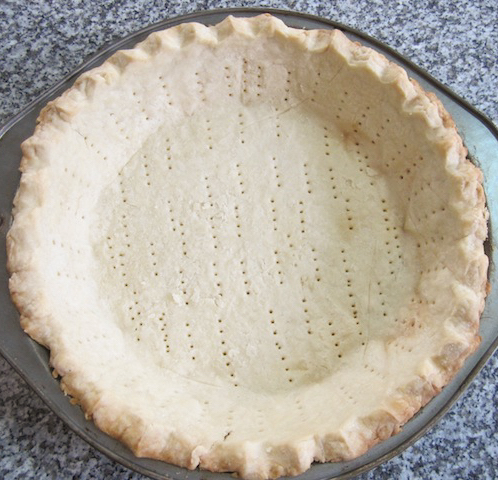 Prick bottom and side of crust all over with a fork, to prevent puffing during baking. 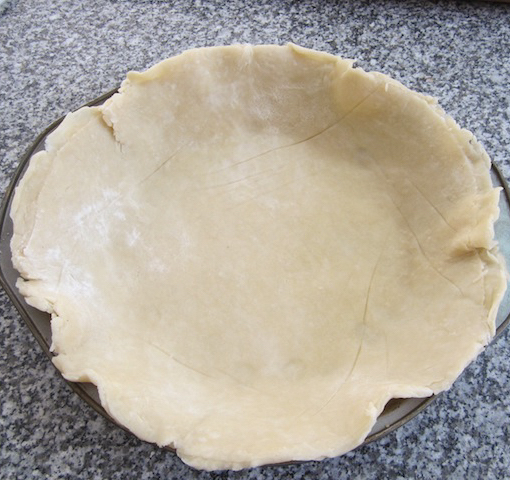 Line the crust with a circle of baking parchment and cover with baking beads or dried beans. Bake for 15 minutes or until golden. 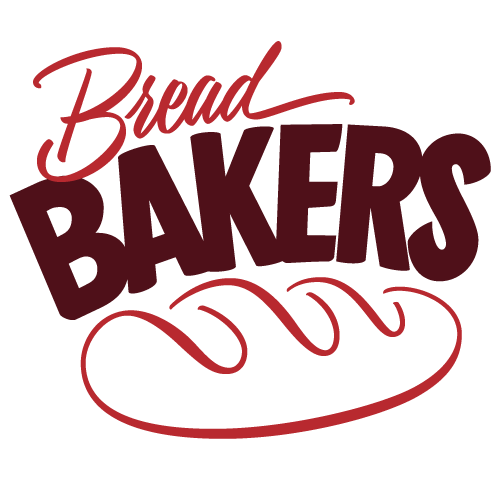 Remove the baking beads. Set aside. Once your custard is cool, you can peel your bananas. 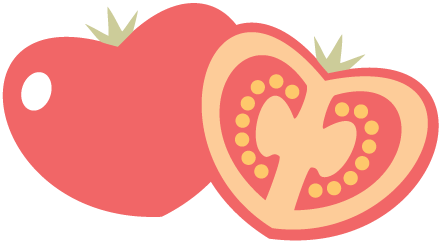 Cut them in half lengthwise. Spread a little of the custard in the bottom of your baked piecrust and then add a layer of bananas. Spread the rest of the custard all over the bananas, making sure to fill in the gaps so that there is no air around the bananas. This will prevent them from going brown. Securely cover the custard with plastic wrap once more and put the pie back in the refrigerator until you are ready to serve. Just before serving: In small bowl with mixer at medium speed, beat cream until stiff peaks form. 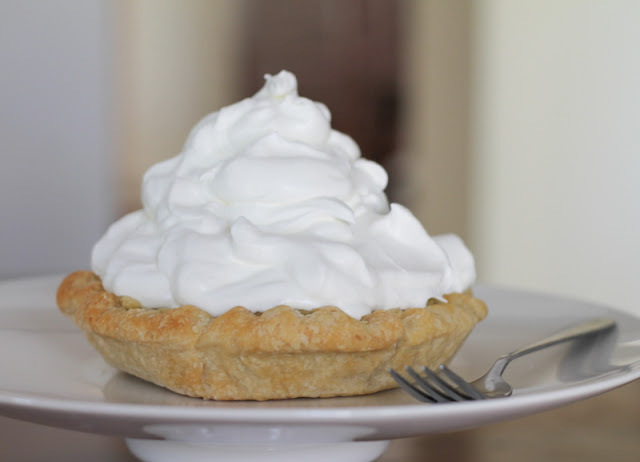 Heap cream on pie. One of my husband's policies is that there is no such thing as too much cream. 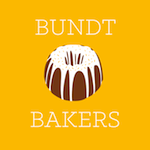 Check out this great list of recipes from my Sunday Supper family! Everybody is sharing their dads' favorites today. Many thanks to our host this week, Sarah from The Chef Next Door.